Mildred Colhouer, 98, of Topeka, passed away December 1, 2018. She was born June 9, 1920. 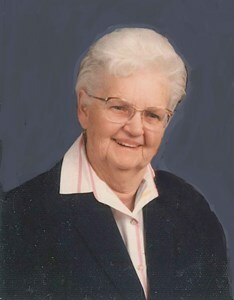 Mildred was employed by Kansas Power and Light for many years before retiring. Mildred and her husband Orville were together for 59 years. He preceded her in death on March 24, 2006. Mildred enjoyed painting and crafts. She also enjoyed camping and dancing with her husband, Orville. Survivors include a step-daughter, Charlene Nesmith; daughter-in-law, Jody Colhouer; step-daughter-in-laws, Marilyn Colhouer, Rose Colhouer; nephew Max Herman; several grandchildren, great grandchildren and great-great grandchildren. She was also preceded in death by her parents; son, Thomas Owen Colhouer; step-sons, Don Colhouer and Darrell Colhouer. Funeral service will be 11:00 a.m. Thursday, December 6, 2018 at Mount Hope Cemetery and Funeral Chapel, 4700 SW 17th Street, Topeka, KS. Visitation will be one hour prior. Memorial contributions may be made to Great Lakes Caring Hospice, 3715 SW 29th Street Ste. 100, Topeka, KS 66614 or to a charity of donor’s choice. To share a memory of Mildred or leave a special condolence message for her family, please click the Share Memories button above. Add your memories to the guest book of Mildred Colhouer.